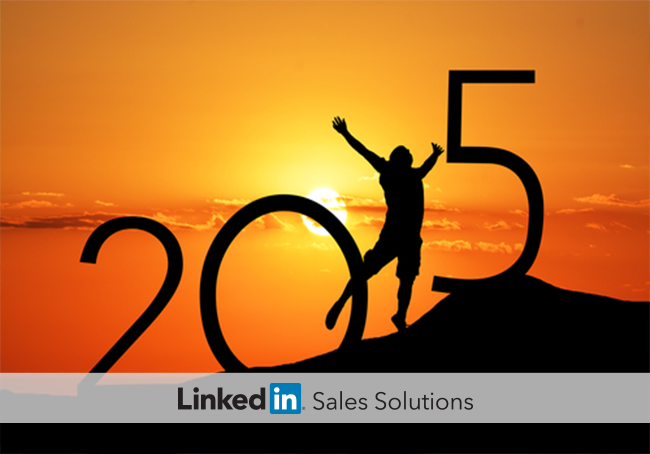 Discover five social selling resolutions that are worth sticking to in 2015 and may bring you greater sales success. The ball has dropped. The confetti, fireworks, and 2015 party supplies have likely been put away or discarded. But what’s not so quick to fade away is the hope and inspiration that fills the New Year. Whether you were shoulder-to-shoulder in a crowded New Year’s party or gathered around the TV with a small group of friends, maybe you too indulged in the moment and thought of a few resolutions to help you reach new heights in 2015. If your resolutions were of the professional kind, then let us help you get started with five social selling resolutions we created just for sales professionals. Ask anyone who is very successful what they spend their extra time doing, it’s often a form of learning. However, when you get busy it’s one of the first things to fall to the bottom of the list. To make sure you keep up-to-date, and ahead of your competition, it’s a must to schedule time for learning. Make your time most effective by setting priorities. For example, do you first need to tackle how to create thought leadership content so that the buyer outreach you conduct will be more effective? How to Use Social Selling at Every Stage of the Buyer’s Journey. Decision makers buy from sales professionals they like and trust. In fact, according to the LinkedIn Social Selling Report, a warm referral increases the odds of a successful sale two to four times. Taking time to engage with others and capitalize on new connection opportunities each day can help you grow your professional network and in turn increase sales opportunities. Top performing social sellers schedule time in their calendar to find new connections via LinkedIn. Get started by researching “People You May Know” or leveraging the “Lead Recommendations” feature within Sales Navigator. Forty-eight percent of B2B decision makers do not respond to sales professionals who don’t personalize their messages. Personalization enables you to leverage insights about the buyer and tailor the message toward their needs (vs. your own). It takes more time and effort to be buyer-centric in your communications, but it can mean the difference between moving a buyer closer to a sale, and having them ignore you entirely. Whether it’s writing an effective LinkedIn invitation or a follow-up InMail, demand more from your communication by empathizing with the buyer. Knowing what tactics are successful, and the metrics behind them, puts you in a prime position for success. For example, the practice of following up with an InMail one to two weeks after the original message was sent increases the prospect’s response rate by 500 percent. Impressive findings such as these remind us that statistics can provide profitable insights. Set yourself up for success in 2015 by determining your own performance goals. Start with metrics such as open rates on your InMail messages. If your open rate is low, then it may be time to test a new subject line and see if that yields a higher open rate. As you evolve your measurement, then you can consider performing A/B tests across a number of performance areas such as; subject line, messages, and calls to action. One of the best places to start is by measuring your Social Selling Index (SSI), a formula that will quantify the value of your social selling. Get more involved with your company’s inbound marketing approach, and the folks that are responsible for top of funnel activity. For example, research shows that B2B companies blogging only one or two times per month generate 70 percent more leads than those who never post. Kick off the New Year with these five social selling resolutions that can easily be implemented and set you up for success in 2015. Here’s to a better understanding of the social selling landscape, identifying what social messages work best for you, and aligning internally for more effective lead generation.